What is it with some people? There are people who do things like grab some free resources they like and then post them to their galleries on DeviantArt. This story is even worse. Rant: Several months ago I found someone who posted one of Nymfont’s fonts as their own. I mean if they like a font, why not MAKE something with the font and then link up to the person’s site, you know? I mean what the heck? Don’t these people realize that the person who made these resources spent hours and hours and hours creating this stuff? There are many many situations of thievery like this. Someone even stole Nymph’s blog design a couple of months ago – right down to the favicon! Ok, so this next situation is just insane! I’ve been working on some resources in my spare time that are solely for gimp and inkscape. It’s part of my *doodle therapy* time. 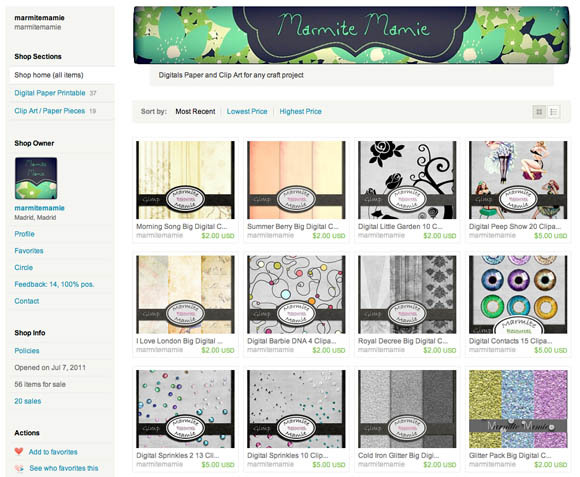 I went over to Marmite Mamie’s profile to see what she’s been up to lately. I highly respect this woman as a digital designer. She ROCKS. Well when I arrived on her profile, the majority of her resources were gone. So I take a peek at her journal to see if there’s a reason for this. Someone STOLE her work and posted it on ETSY for SALE!! Not only that, this woman even stole her name! Look at these screen-shots below. Can you believe this? I’m just in shock. Last night I was so tired and ready for bed… I was so sad in the thoughts that all of Marmite Mamie’s resources would be gone forever. Apparently she’s going to re-post them with some modifications to the previews and TOU. It looks like she’s gone ahead and made her own shop on Etsy. I highly encourage supporting this amazing artist. Thanks for sharing! More people need to speak out about this sort of issue! Maybe if it were more often brought to light people would be less apt to do it! I see it on A DAILY! I really do! Wow, yeah. This sort of thing is so sad. Marmite Mamie had so much already going on in her life when this happened too. It's horrible. 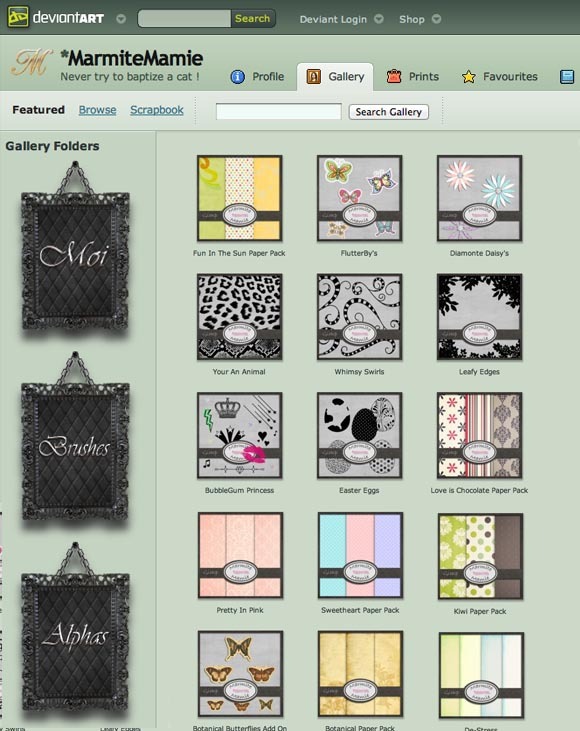 Thank goodness Etsy closed the offending shop down. That user still has the shop name though :(. 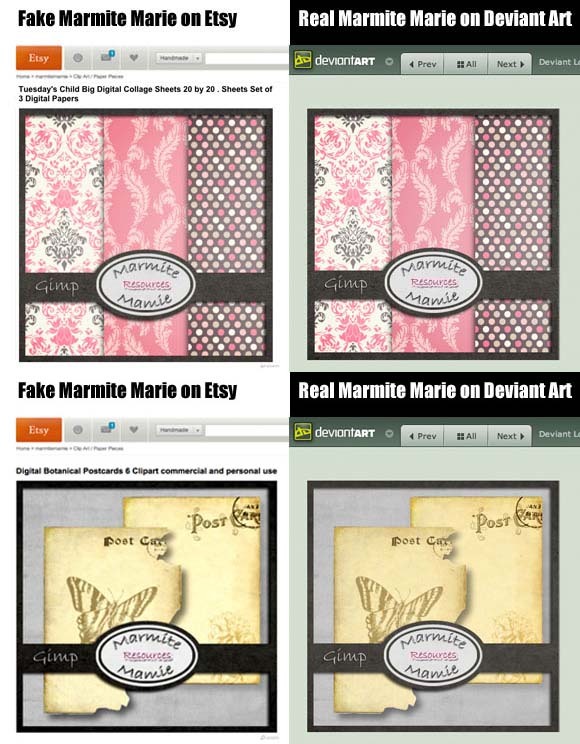 I'm so glad that Marmite Mamie is going to re-post her resources. At first I thought they were gone forever. It's good that she pulled everything though, it's sort of like a heads up. If people continue to abuse things, more and more freebies will become paid resources. that is so sad! I hope she didn't make much money off that. This is insane! How rude can a person be? Unbelievable! At first when I read this I thought maybe someone didn't know what they were doing, like me being new to this graphic stuff. But heck no. How can someone do something like this? I have been hurt before by people like this. I am so mad about it. Crazy,karma may get them one day! This happened to a jewelry making friend of mine, too. The offender went as far as stealing the photos and marketing the pieces as her own when the jewelry was still in the possession of its creator. I'm guessing that she'd buy the item from my friend once she sold it with her markup. It's amazing what people rationalize as proper behavior. Unbelievable!! but do not worry, we support you because we know you are a great designer, I personally think so, and I admire you. Best wishes. That is just awful — and unfortunately, too believable 🙁 It's about as low-down as you can get! Thank you for posting this story. It's something we all need to be aware of. I've posted a short summary on my site along with a backlink to here for everyone to see the images. I'm happy that this person has been exposed & in my opinion, the more that know about it, the better. This is just terrible! I always ask for consent. One time I wrote a poem about the loss of my son and had it on a background. This lady erased my name, claimed it as her own. When I wrote to her she told me off and that she had written it. Some people are awful. If I ever have used something I should not have I will remove it promptly. It is always safe to read tou and ask. That makes me sick! I just don't get people being so terrible to others & stealing designs! There are people in this world that don't care a flip about others & do whatever they want. Designing is very personal & time consuming. You put your heart & soul into making something you can be proud of. Thank you for sharing. This is so absolutely outrageous! I tell you, there is no end to what people will do to make a quick buck or two even if it is off the back of someone else's hard work and creativity and time and effort. I'm so disgusted by this, all I can do is shake my head in disgust, anger and disbelief. If we, the HONEST AND UPRIGHT sent a complaint every single time we see this kind of thing happening it would make a huge difference. I think we should have our own "Flash Mob" type thing. Once someone see's something like this, or better yet, any theft at all we should all flood the site enmass and post our demands to have the stolen property removed from the site and thief banned. Heck this would teach any and all thieves to beware or they risk being exposed in a BIG way! Thanks for reposting this darling, we need to spread the word when we find these things. I'm serious about the flash mob type thing. I'd be glad to gather emails and to be responsible for sending out the alarm with a date and time set for our "flash mob" action. Who's with me? I'm serious now. If at least 10 people respond to this with their email addy's I'll coordinate a "Blasting" within a day or two of being notified. Who's in?? @Sassy I'm up for that! I've seen some things re-posted on the web here and there, but mostly free items. I downloaded one just to see, and my assumptions were correct, all artist data was removed from the item, so it's difficult to figure out who's work it is. If enough users were involved in a "flash mob" sort of thing, the items could potentially be recognized by seasoned users in the digiscrap community. Thanks so much for suggesting this idea! !